Lawrence City Hall is located at 6 East Sixth Street, Lawrence KS 66044; phone: 785-832-3000. Photo: S. T. Zimmerman House, ca. 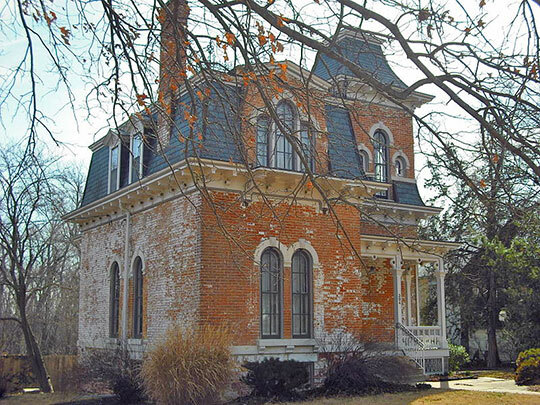 1870, 304 Indiana Street, Lawrence, KS. Listed on the National Register of Historic Places in 1974. Photographed by User:Bhall87 (own work), 2009, [cc-by-3.0 (creativecommons.org/licenses/by/3.0)], via Wikimedia Commons, accessed July, 2015. The principal educational center of the State is divided by the Kansas River into two segments North and South Lawrence. Home of the University of Kansas, Haskell Institute, and Lawrence Business College, the city is also important as a shipping point for potatoes, corn, wheat, and alfalfa grown in the rich valley land around it, and as an industrial center. South Lawrence or "Lawrence" as distinguished from "North Lawrence" clings to the north, east, and south slopes of a hill that forms the divide between the valleys of the Kansas and Wakarusa Rivers, and spreads down into the level bottomland on the south and east. Massachusetts Street, the city's main thoroughfare, for the most part skirting the foot of the east slope of the hill, bisects the town, and extends from the river southward through the business district to the outskirts. The older residential districts on the first gentle slopes of the hill west of Massachusetts Street, have an atmosphere of nineteenth century New England with brick paved streets, low retaining walls, broad landscaped lawns, and old mansions of brick and stone designed in the Mid-Victorian style. The newer sections, on the western and southern limits, are as modern as those in the average prosperous Kansas city. North Lawrence is a semi-suburban community of modest homes and small stores clustered about the Union Pacific Railroad yards and extending along the two highways that enter the city from the north. Little remains of the old Lawrence that played such an important part in the history of Kansas during its struggle for statehood. The dusty streets that resounded with guerrilla war cries and hoof-beats of the galloping horses of William Quantrill, John Brown, and Charles Robinson are now wide traffic ways lined with business houses or comfortable dwellings. "The Hill," overlooking the town and known as Mount Oread, is no longer crowned by Free State fortifications but by the buildings of the University of Kansas. Modern homes, the property of local chapters of national college fraternities, stand where early settlers built log cabins; and streamlined cars, usually borrowed from indulgent fathers back home, sweep down the brick-paved hillsides. The fine old homes in Lawrence, which have escaped being turned into student rooming houses, stand aloof behind protective screens of shrubbery. Completing the contrast is Haskell Institute, a Federal Government high school and junior college for Indians, where smartly-clad Indian co-eds and white-collared braves seek to adjust themselves to a new culture, replacing lacrosse and the old war cries with football and "Rah! Rah! Haskell!" Founded in 1854 by the New England Emigrant Aid Company and named for Amos A. Lawrence of Boston, a prominent member of the company, the town was originally planned as the capital of Kansas. Dr. Charles Robinson was hired by the New England financiers to look after their interests. As the center of Free State activities the town was a hotbed of warfare throughout the Territorial years. By March 1855 Lawrence was a growing and prosperous town with 369 voters. Late in November of that year, Charles W. Dow, a Free State man, was shot at Hickory Point, ten miles south, by Franklin N. Coleman, a pro-slavery settler, and the enmity between northern and southern settlers of Kansas and Missouri reached the boiling point. This incident precipitated the Wakarusa War. Jacob Branson, with whom Dow lived, was rescued by Free State friends after he was arrested by Samuel J. Jones, sheriff of Douglas County. Sheriff Jones, a pro-slavery man, retaliated by tricking Territorial Governor Wilson Shannon into sending out the militia (which then consisted largely of Missourians who had come across their State Line to Kansas at the call of Sheriff Jones) to put down the "rebellion" at Lawrence. This army camped at Franklin about three miles east of Lawrence. Finally after a week of siege the citizens of Lawrence sent a delegation to the Governor to acquaint him with the true state of affairs. Incredulous, the Governor went to Lawrence to examine the situation and, seeing that he had acted too hastily, called the leaders of both sides together and drew up a peace treaty. On May 21, 1856, Sheriff Jones returned to Lawrence this time under the pretense of serving some writs. Before he and his forces left, the town's newspaper offices were dismantled, their presses broken to pieces, and their type thrown in the Kansas River, several stores and residences were robbed, and Dr. Robinson's home was burned. One man, a member of the Jones band, was killed. Citizens of Lawrence declared that an American flag, whipping in the breeze atop the Free State Hotel, knocked off a brick that dropped on his head. After five years of strife the Free State faction was triumphant. The Wyandotte Constitution, under which the State was admitted to the Union, was adopted October 4, 1859, and two months later an election of provisional State officers was held in which Dr. Charles Robinson was chosen Governor of the new State. Robinson's fellow townsman and political rival, Gen. James H. Lane, was elected to the office of United States Senator by the first State legislature, which convened in February 1861. At daybreak on August 21, 1863, Lawrence citizens were aroused by the sound of firing and the shouts of guerrilla raiders who swept down on the town from the east, led by the notorious irregular, William Clarke Quantrill. After shooting down the Reverend S. S. Snyder in his barnyard, two miles east of town, Quantrill's command, numbering 450 men, all mounted and heavily armed, galloped toward the city. Opposed to them were only a few unarmed recruits, twenty of whom were mowed down by the raiders. The guerrilla band moved north on Rhode Island Street and was soon racing down Massachusetts Street, Lawrence's main thoroughfare, toward the Eldridge House. The guests of this inn were spared and allowed to go to the City Hotel while the guerrillas sacked the Eldridge and set fire to the building. The raiders then divided into squads of six or eight men and scattered over town, slaying and burning. After four hours they withdrew, leaving 150 dead and the major portion of the town in ruins. So futile was the resistance offered by the surprised and terror-stricken citizens that the Quantrill band retired with the loss of only one man. Twice sacked and burned in the first decade of its existence, Lawrence rose from its ashes like the fabled Phoenix, although progress was some what halted during the Civil War. The Kansas Pacific, one of Kansas first railroads, was built through the town in 1864 and with the increasing development of diversified agriculture in the fertile valleys on either side of it, Lawrence became a prosperous trading and shipping point. Less affected by synthetic booms than many Kansas cities, the growth of the town has been gradual, and its economic structure has been established on a substantial foundation. Among the industries of the city are a large flour mill that utilizes power from the Kansas River, an organ factory, a paper box factory, a cannery, a wholesale seed house, a wholesale grocery, and a poultry packing plant. Lawrence is also the site of one of the largest fraternal insurance companies in the United States. Paul Starrett, building and structural engineer, who made important contributions to the practical design of skyscrapers in Chicago and New York City during the early twentieth century, was born (1866) in Lawrence. He wrote Paul Starrett: Changing the Skyline, in 1938. Federal Writers' Project of the Works Progress Administration for the State of Kansas, Kansas: A Guide to the Sunflower State, Kansas State Department of Education, The Viking Press, New York, 1939.